Dean Jacobs is an author and world traveler, as well as a 1986 alumnus of WSC. Author and world traveler Dean Jacobs '86 spoke Oct. 21 as part of the 2015-2016 lecture series. The names of Anna Quindlen, Henry Winkler and Robert Edsel make an accomplished list of speakers. Complete the list with Dean Jacobs, Wayne State College graduate, writer, photographer, explorer and educator. He was added to this prestigious list for the 2015-2016 Omaha Town Hall Lecture Series with a speaking engagement at St. Andrew’s United Methodist Church in Omaha on Oct. 21. “For 50 years Omaha Town Hall has been bringing speakers of great distinction to entertain and edify our membership. Our choices have been richly eclectic, encompassing authors, actors, journalists, publishers, politicians, musicians, artists, athletes, military leaders, scholars, humorists,’’ states the Website for the Lecture Series. The list of past speakers includes Vincent Price, Erma Bombeck, Will Rodgers, Jr., Winston Churchill II, Dr. Joyce Brothers, Hugh Downes, Malcom Forbes, Norman Cousins, John Powers, Art Linkletter, Charlton Heston, Alexandra Stoddard, Beverly Sills, Bob Woodward, Ed McMahon, Peggy Fleming, Richard Simmons, Scott Hamilton and Billie Jean King. The 2015-2016 Series includes Jacobs and other famous Americans including Anna Quindlen, Pulitzer Prize winner and American novelist; Henry Winkler, educator and author actor best known for his character, “Fonzie;” and Robert Edsel, ranked tennis player, pioneering oilman, co-producer of an Emmy-nominated documentary film and best-selling author. Jacobs was born in Wahoo. Living on a farm until he was 5, Jacobs later grew up in Fremont. After earning a WSC degree in Biology with minors in Earth Science and Art, Jacobs worked as assistant to the WSC President before moving on to Purina Mills and Pfizer Pharmaceuticals where he was employed in sales and marketing for a decade. An initial traveling adventure of 22 months and 28 countries marked the end of his corporate career. He bought a map and started putting dots on things he wanted to see but thought he never would. Starting in 2001, he personally connected the dots for two years with travel on a budget of $15 a day. By taking photos, Jacobs documented common humanity. He has visited more than 50 countries. He brings his experiences to children and adults everywhere through school presentations that focus on the goodness of humanity and the awe of nature. By offering audiences the opportunity to see these qualities in others and themselves, Jacobs leaves them inspired and empowered to make their world a better place in which to live. He participates in the Dian Fossey Gorilla Fund Project, Achuar village Education Project and has written Wondrous Journey — The World is Waiting for You, a large-format paperback with color pictures that documents his two-year journey throughout the world. His most recent book, Wondrous Creatures, won an IPPY award and has become a resource for educators and parents with exciting photos of animals taken from journeys around the world, real world examples and stories of animal habitats. The illustrated book teaches about animals, habitat and conservation including journal entries from his travels, maps and facts. 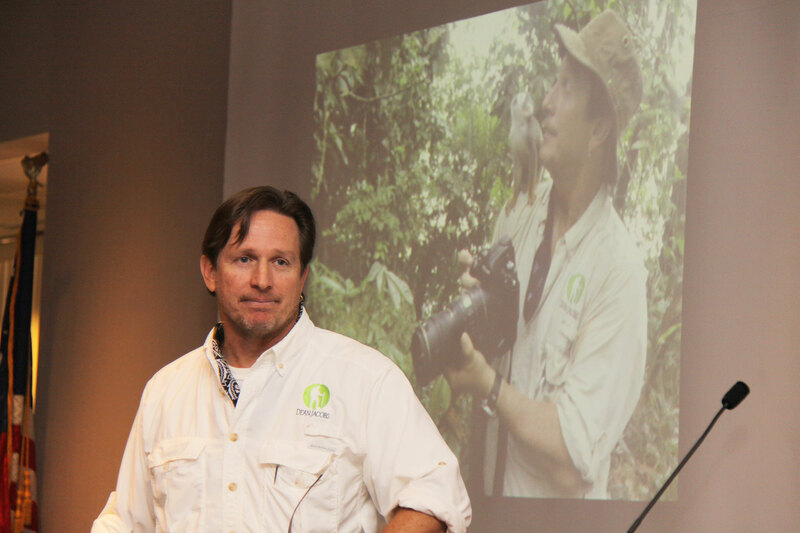 His presentations include “Wondrous Habitats’’ for elementary to middle school level students, “Wondrous Mississippi’’ taken from his two-month journey following the river for 2,300 miles from its source to its mouth, “All Things Amazon’’ that explores the Amazon River and rain basin with information from his six-month journey and “A Journey with Mountain Gorillas,’’ a lesson that builds on his work with the Dian Fossey Gorilla Fund in Rwanda and the DRC of Africa. When not traveling, Jacobs creates as a contributing newspaper columnist, photojournalist, children’s book author and keynote speaker across the country. Jacobs promotes the Seven Wonders of Humanity: Dignity, Respect, Humility, Curiosity, Generosity, Gratitude and Kindness. Wayne State College, a regional, public four-year college in northeast Nebraska, is a member of the Nebraska State College System.